Home > General Country Sports > Can I Afford to Take Up Golf? There is a common perception of golf as a game for the rich. Many people presume that only those who are recently retired and have money in their pocket can afford to play. In reality, golf is becoming more and more accessible. Yes, there are unavoidable costs. But it is possible to keep these costs down while still enjoying the game. There is a wide range of costs that you might incur as a golf player. Not all of these are immediately obvious. Perhaps the most immediate cost is that of equipment. Golfers need quite a lot of specialist kit, and some of this does not come cheap. You will, of course, need a set of clubs. 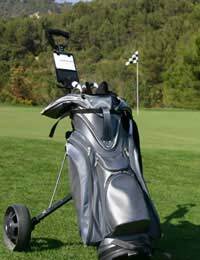 As with much other sports equipment, golf clubs are available at virtually every price point. As bizarre as it might seem, you can, if you wish, spend thousands of pounds on a single club. On the other hand, if you just want to dip your toe in the water, it is perfectly possible to pick up an entry-level set for less than £100. You should also bear in mind that you may need specific clothing. At the very least, you will require a pair of golf shoes. These are studded, to help you grip in poor weather. Bear in mind that many courses have banned metal studs, so you might want to choose plastic instead. In addition to this, you will require balls, tees, and ball markers. Again, these are available at a range of price points. In fact, some clubs will offer the hire or loan of these items. The next most obvious expense is that of club membership. Many golfers presume that they need to join a club in order to play, and this can be a hugely expensive proposition. It is not uncommon to spend thousands of pounds on club membership over the course of the year – and this is, inevitably, out of many people’s price range. You should remember, though, that club membership is not a prerequisite for playing golf. Many courses offer per-game access and, while this means that you won’t be able to take advantage of some of the other benefits of club membership, it does mean that you can play golf in a more affordable way. Golf can be expensive. But there are a simple ways that you can keep the costs down while still enjoying the game. Amongst the most effective ways of cutting your costs is to abandon club membership. There are plenty of courses around the country that will allow you to play on a game-by-game basis and, unless you are planning to play 18 holes every day, this will work out far cheaper. You should also consider which courses you play. Generally speaking, the best courses are the most expensive – but that doesn’t necessarily hold further down the table. In some cases you may find that you are paying more for the name or prestige of a club than you are for the quality of the course, so it makes sense to shop around. Finally, remember that it is always possible to pick up second hand golf equipment. Many clubs have their own second hand shop on-site, where they will be able to advise you about what to choose. Alternatively, check online for deals.